This is the complete automation of a manufacturing facility such as a factory. All functions are under computer control. 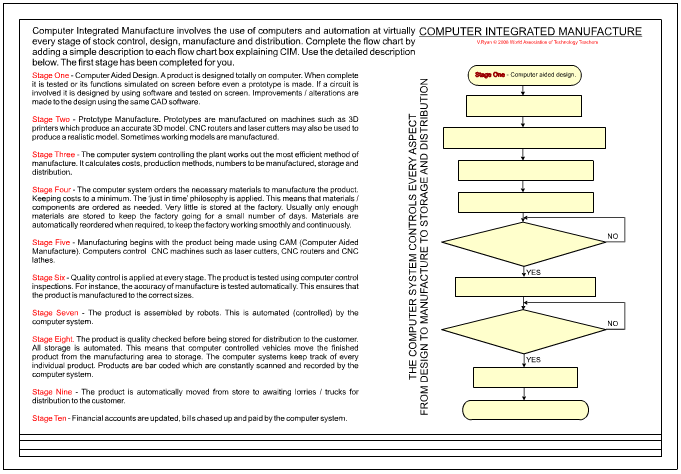 This starts with computer aided design, followed by computer aided manufacture, followed by automated storage and distribution. One integrated computer system controls all that happens. The animation below shows how a computer control room directs all operations inside the factory. The factory below manufactures DVD / CD Storage units. The computer system is in control of every stage from design and the ordering of materials to the manufacturing processes and distribution to customers. Stage One - Computer Aided Design. A product is designed totally on computer. When complete it is tested or its functions simulated on screen before even a prototype is made. If a circuit is involved it is designed by using software and tested on screen. Improvements / alterations are made to the design using the same CAD software. Stage Two - Prototype Manufacture. Prototypes are manufactured on machines such as 3D printers which produce an accurate 3D model. CNC routers and laser cutters may also be used to produce a realistic model. Sometimes working models are manufactured. Stage Three - The computer system controlling the plant works out the most efficient method of manufacture. It calculates costs, production methods, numbers to be manufactured, storage and distribution. Stage Four - The computer system orders the necessary materials to manufacture the product. Keeping costs to a minimum. The ‘just in time’ philosophy is applied. This means that materials / components are ordered as needed. Very little is stored at the factory. Usually only enough materials are stored to keep the factory going for a small number of days. Materials are automatically reordered when required, to keep the factory working smoothly and continuously. Stage Five - Manufacturing begins with the product being made using CAM (Computer Aided Manufacture). Computers control CNC machines such as laser cutters, CNC routers and CNC lathes. Stage Six - Quality control is applied at every stage. The product is tested using computer control inspections. For instance, the accuracy of manufacture is tested automatically. This ensures that the product is manufactured to the correct sizes. Stage Seven - The product is assembled by robots. This is automated (controlled) by the computer system. Stage Eight. The product is quality checked before being stored for distribution to the customer. All storage is automated. This means that computer controlled vehicles move the finished product from the manufacturing area to storage. The computer systems keep track of every individual product. Products are bar coded which are constantly scanned and recorded by the computer system. Stage Nine - The product is automatically moved from store to awaiting lorries / trucks for distribution to the customer. Stage Ten - Financial accounts are updated, bills chased up and paid by the computer system.